New Wine Case Special -- 20% Off Before Club Discount! For the first time ever, we're offering an additional 20% off any full case (12 bottles) of a single wine that you order--that's in addition to your club discount. It's a perfect time to stock your cellar for the summer parties, graduations, reunions and BBQs on your calendar. The savings are really signficant. For example, if you are an Estate Wine Club member and you purchase a case of our delicious 2013 Cabernet which retails for $480, your price is $288--a nearly $200 savings, or 40% off. To order cases, please email me, since we have to manually combine the discounts to get you this special price. Please note that the 2013 Petite Sirah (now $75) and 2013 GSM (now $65) are both almost gone, so the price on those wines has increased to library levels. The 2016 Flora Rosé is going fast, so re-order now if you want more. For a full list of our current and library wines, go to www.RangelandWines.com/wines. We are busy preparing for our annual beef harvest and club offering. This year's heavy rainfall resulted in abundant forage and happy, grass-fat cattle. In the next several weeks we will be harvesting our two year olds, hanging the meat for about two weeks and then cutting the beef, packing the cuts into club boxes, and shipping to our club members. We will release the beef club for pick up on July 1, with shipping starting July 10. Keep an eye on your inbox for emails regarding the billing and shipment of your club box. We still have some room in the beef club, so if If you'd like to join, sign up here. Spring has always been a busy time Adelaida Springs Ranch, but this one has been wild! We had over 58 inches of rainfall since the season started last fall. The result has been a glorious green spring and continuous work getting the vineyard mowed, tilled, weeded, sprayed (for mildew prevention), pruned and thinned. Our new vineyard manager Patrick Hamilton has logged countless hours on the tractor and in the rows with our labor crews, getting the vineyard in shape. Winemaker Paul Hinschberger is in field, troubleshooting the irrigation system and directing the work. Ranch Manager Eddie Burch has been fixing mowers, chainsaws and tractors as fast as we can break 'em, when he is not tending livestock and fixing fences. 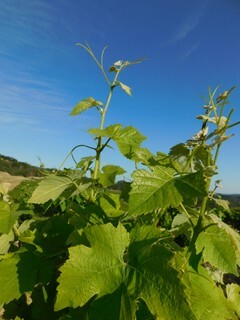 Our vines are showing a lot of health and fruitfulness. The graceful tendrils at the shoot tips are really stretching out, reaching for the sun. If we can get through the current bloom and the fruit sets successfully in June, we expect a return to normal grape yields this fall. That means more delicious wine for all of us. After 5 years of punishing drought, it is a huge relief to see the spring verdure and vigor return to the vineyard, grasslands and woodlands; really the whole landscape. Despite the ceaseless work that the ranch requires, Lisa and I feel the unremitting stress of dryer times falling away. Since our winery permit was set back in February, we've been working on opening a tasting room in Templeton. We hope we are near to finalizing a deal and will keep you posted as this develops. We expect to have something open this fall. In the interim, winemaker Paul Hinschberger has been conducting tastings in the barrel room at Denner (by appointment with us), where we make our wines. He's been enjoying meeting customers in his "office" and it is a fun experience to be in the barrel room, around the delicious aromas and ambiance of a large winery. Nevertheless, we have missed being able to host you at the ranch and our arms are getting tired throwing Arrow his ball! We continue to work on our long-term goal of having a tasting room and winery on the ranch, possibly using an alternate access road. We so appreciate your ongoing support as we work through these changes.